Hanoi (VNA) – Malaysian Prime Minister Najib Razak arrived in Tokyo on November 15, starting a three-day trip to Japan. This is the fourth visit to Japan by Najib Razak since he took office in 2009. 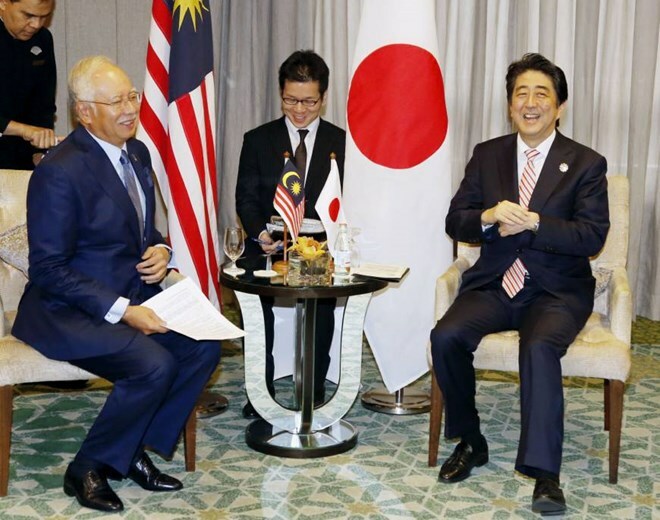 The Malaysian PM is scheduled to hold talks with his Japanese counterpart Shinzo Abe and meet with Minister of Land, Infrastructure, Transport and Tourism Keiichi Ishii, Chief Executive Officer of the Japan External Trade Organisation Hiroyuki Ishige, and members of the Japan-Malaysia Parliamentary Friendship Association. In addition, Najib Razak will witness the signing of an agreement on transferring the Japanese coast guard force’s two second-hand patrol ships to Malaysia, which he said aims to help increase his country’s capacity in ensuring safety and security in its waters.